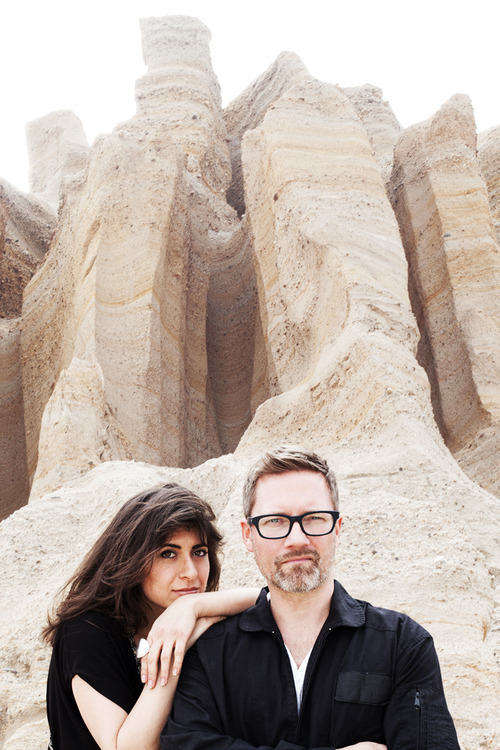 Dave Hodge and Leah Siegal are the masters behind the dreaming synth-pop group Leisure Cruise. On May 6th, the New York duo released their full length album— bearing a whole-lotta of butts on it’s album cover. Drawing inspiration from the discovery of new planets that could support human life, the album brings us a futuristically optimistic soaring synth-pop sound. In two words: It rocks. Dave and Leah gave us some insight on their creative process, their super cool parents, and why it’s totally ok to describe their music as “curling up in a sleeping bag full of kittens.” Sit back, relax, and enjoy the ride. WM Where did you two meet? The first time we met was at Dave’s studio in the city. Leah was recommended to him to sing on something he was working on. But neither of us can remember who it was who brought us together. That was about 4 years ago. Then last year we ran into each other in our neighborhood. Dave asked Leah if she wanted to write “a song”. So we did shortly after. WM When you two started writing together, did you have a specific vision in mind or did you just….start? Dave: I had a vision, but it was different then. I expected to produce a record and have all of my friends write a song, or write on one of a dozen or so instrumentals that I liked and were hanging around in my catalogue. Leah happened to have some time on her hands, waiting for her own record to get mixed and mastered. After we recorded 5 songs together, the vision started shifting. After a couple more were written and we realized we were making a cohesive full length record, everything pointed towards becoming an official band. WM Describe your process. Who does what? How do you communicate and create with each other? Dave is responsible for the entire recording process. He engineered, mixed and mastered the record. So that’s what he does. As far as how we write and communicate, Dave sits at the controller and plays around with sounds and progressions until both our eyes light up. Leah sits on the couch with a notepad and waits for melodic and lyrical inspiration to lead the way. We keep it very collaborative as far as sharing our opinions, looking for sounds and progressions, or questioning lyrics and shifting melodies and ultimately we have never proceeded with anything we haven’t agreed on. One track in particular we had very different ideas about. We just let it sit for a while. Then we’d debate each other down. Then sit. Then we decided we’d both know when it was right. And that’s exactly what ended up happening. So simply put, we trust each other. WM Has your creative process, the way you write, the way you create, changed since you started working together? Of course. It’s very polite in the beginning. But we became fast friends. So we fart a lot in front of each other now. WM Do you have a favorite part of the creative process? Leah: There’s a moment when the song, or even just an idea, comes together and I get a flash flood of emotion from the richness of all the sounds, melody and meaning, and I get choked up, sometimes to tears. It happens at some point during the creation of every song. Sometimes there’s a delay and it happens months later while I’m performing it and I have to hold back tears on stage. It doesn’t last for longer than a couple of seconds when it happens, but that’s the part I live for. WM My favorite moments are when we sense that a really good song is coming together, at the early stage.. and we know that we’re on to something that we should pursue. Then again when I’m really happy with how it’s sounding, near the end of the process. WM Leah— tell us about your Dad. I mean NPR is cool. And he seems pretty cool. It is. And he is. I’m lucky to know him. It was both exceptionally cool to be raised by a man with such talent as his, and uniquely difficult to imagine I have to fill his shoes. It took me a very long time and a lot of courage to get my own pair of shoes, especially since his shoes are so cool. By the way, my mom is also an incredible woman, super smart, and beautiful to boot. She deserves a lot of credit for encouraging my dad NOT to get a job selling life insurance when they were starting our family and he hadn’t yet found a job in journalism. So she took a job in a mailroom and made sure he stayed in his field. I also have a beautiful and talented sister who also wears a brilliant pair of shoes of her very own. I’m very blessed and grateful. WM You just released your self-titled album, where did the name Leisure Cruise come from? When we started writing, we had no idea that all of this would come out of it. We wanted to have fun and we decided we’d keep writing as long as it was fun. Leisure Cruise strikes that tone for us and that’s what we want to share with people. WM Do you see Leisure Cruise fitting into a specific genre of music? How would you describe the sound to someone who has never heard it? WM How has your musical identity changed or evolved since you started Leisure Cruise, as opposed to the other bands and projects you were a part of? Probably need another year of hindsight to answer this one. WM So much of writing a full album must come from personal events and experiences. How have your past and personal experiences affect the themes in this album? We kept things pretty universal. A lot of our inspiration came from the discovery of new planets that could support human life. Hence our track H.R.P (Human Relocation Program). This idea also partly inspired our band name, Leisure Cruise. Actually we spent a lot of time talking about the apocalypse and the possibility of that kind of major change, a planetary shift – some days it made us feel better about the future, like a nice dream. WM What does this album mean to you? A totally unexpected and new direction for us both. Happily. WM The cover of your album is pretty amazing. How important is the visual representation of your album? Your videos, album art, etc. Dave: We went to Storm Studios in London, who have designed about 50 of the top 100 album covers of all time. We love their art. We wanted to created something unique, and visually stunning and surreal. Storm Studios does surreal like nobody else, and photographs as much as possible (they built a lot of the props and shot them), before compositing. Being a fan of photography, this is the ultimate… having custom images designed for our music. WM Why all the butts? WM Are you trying to evoke a certain reaction or emotion from your audience— with your music or your album art? We want to feel ‘good’ and we want everyone who hears our record to feel ‘good’. WM What do you think is the most effective way to connect with your audience? Hopefully the music we’ve made is effective in connecting with our audience. WM Do you have any live shows on the calendar? We just played Bowery Ballroom in NYC, and we’re booked for several shows in Toronto and Montreal for Canadian Music Week. And we’re about to confirm our record release show in Brooklyn on May 31st, at Baby’s Alright. Lots of other shows on the table but not yet confirmed. WM I think people tend to forget that being a musician, no matter how passionate you are, is a job, a career, a lot of work. What do you think is the hardest part of being a musician? Social networks. Our brains are oozing out of our ears spending days on Twitface. None of it’s easy, really. It takes a massive amount of work and dedication. To write, to make, to perform, to sell, to tour, and do it all over again. But we’d say the hardest thing, at this point, is cutting through the infinite amount of chatter on the internet, and getting people to hear what we’ve spent all this time on. So many bands, so much information. That’s the biggest challenge of all, these days.